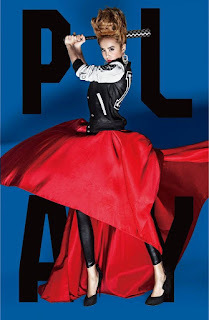 Jolin Tsai is a hugely popular Taiwanese recording artist, whose career has been peppered with smash hits, sold-out concert tours and constant Madonna-style image reinventions. As is often the case with North Asian celebrities, Tsai has expanded her performing career to incorporate modelling, consumer goods promotion, and acting - most recently providing the voice of Judy Hopps in the Chinese edition of Disney's Zootopia. Play, released in 2014, is her most recent album to date. It is a collection of bright, superficial pop songs that was a huge success in her own country. Given the right melody I can really engage with sugary, superficial pop music, and I had particularly enjoyed Tsai's earlier 2012 album Muse. Sadly Play does not match up. There are a few too many songs here that simply lack that ear worm quality that makes for great pop music. Asides from one highlight it is all just a bit too ordinary and disappointing. The album opens with "Gentlewomen", a song rich with Middle-Eastern inspired sounds that combine with distorted guitar riffs as it progresses. It is a solid pop track, and certainly it tends to get better as it goes, but ultimately it feels like an underwhelming entrance into the album. Tsai is capable of much better, as he earlier albums suggest. "Game" is a callback to her earlier hit "The Great Artist", using very similar sounds and arrangements. It doesn't come anywhere close to catching it - I think "The Great Artist" is probably her single-best song - but it's a catchy sort of commercial dance number. "Medusa" offers a slice of solid pop music. Tsai has a good voice for this kind of pop, and her songs more often than not hit some great electronic bass notes. Her biggest problem is the one that affects most popular recording artists of this type: as her songs all sound somewhat self-similar. The fourth track, "Lip Reading", is thankfully a slower and more sultry kind of a song, with a nice orchestral sound to it. It helps it stand out a little. "I'm Not Yours", a duet with the so-called "Queen of J-Pop" Namie Amuro, is a dance number with a particularly infectious ear-worm quality to it. I have a peculiar weakness for this kind of ultra-commercial pop music: I find myself liking it despite my better instincts. It is definitely the best track of the album; the sort of song that you catch yourself humming weeks later when you're not paying attention. "I Love, I Embrace" marks a second shift to a slower pace. Unlike "Lip Reading" it is pretty generic and forgettable. "Miss Trouble" offers strange combinations of reggae and hip-hop influenced verses and slightly operatic choruses. It's a combination that works surprisingly well. After that, however, we get "Phony Queen": a generic and forgettable dance-pop song that sounds an awful lot like a lesser Kylie Minogue song. "The Third Person and I" immediately sounds like a break from the rest of album, with its gentle rhythm and guitar-based melodies. It's nice to see a change in style, but unfortunately that change results in a pretty generic Chinese pop ballad. I like the intention, but not the result. The album wraps up with "We're All Different, Yet the Same". It's quite a soulful climax, but like most of the album's tracks it is competent without being remarkable. After really enjoying Muse I found myself disappointed with Play. There is no word on when the next album is coming out, but I really do hope it brings more of the energy of the former and less of the generic elements of the latter.